Best Dog Training in Raleigh! Welcome to Bark Busters Home Dog Training of Greater Raleigh. As a Bark Busters behavioral therapist and trainer, I'll work with you to overcome the challenges you are experiencing with your dog. Before becoming a trainer I worked as a Certified Veterinary Technician for 16 years in over five states at small local clinics, large progressive clinics and emergency centers. This extensive experience allowed me to see first-hand the range of behavioral challenges many dog owners face. Since becoming a Bark Busters dog trainer and therapist I've seen the dramatic changes our methods produce for modifying undesirable behavior, while also establishing basic obedience. My dog behavior training territory includes Wake Forest, Raleigh, Durham, Louisburg, Franklinton, Rolesville, Bunn, Knightdale, Creedmoor, Kittrell, Wendell, Youngsville, and Zebulon. By teaching you a system of communication that your dog already knows based on canine communication and pack behavior, you will learn how to use your body language and vocal communication to obtain your dog's focus and respect, without pain or treats. You can then educate your dog on what behaviors are acceptable and which are not. Our methods are designed to enhance the human-dog relationship by developing a balance of trust, respect, and bond. At a time convenient for your household, I will come to your home where experience has shown dogs learn more quickly, suffer less stress, and pay attention. After an assessment of your personal situation I will tailor the dog obedience training to address the issues most important to you, based upon the temperament and needs of your dog. Bark Busters believes in its methods so strongly that we offer Guaranteed Lifetime Support. Bark Busters will return, free of charge, to work with you if any new behavioral issues arise or you need a refresher course, for the lifetime of the dog. As a lifelong dog lover, I am excited to share my passion and commitment to improving dog's welfare using Bark Buster's proven and humane methods and I look forward to discussing how I can improve the relationship with your dog. Sonja explained the training techniques in a way that was easy to follow and understand. Piper and Tokie responded well to the training and we are pleased with the natural training techniques used. This experience was interesting and enjoyable and we would recommend Bark Busters to my friends, family and neighbors. Sonja explained everything in a way that was easy to understand. All the problems experienced with Bonnie Ray have been covered and the techniques used were easy to follow. 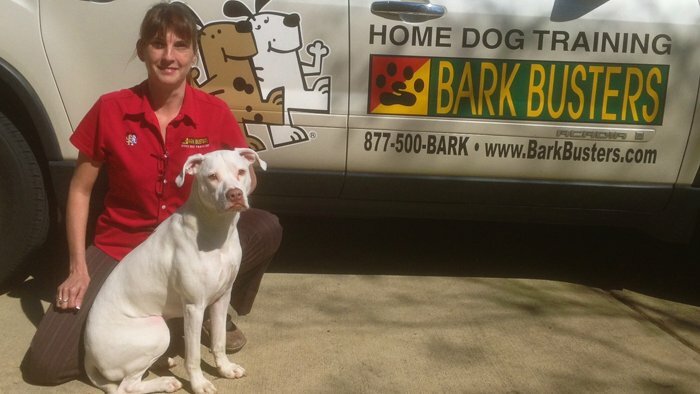 Bonnie Ray responded well to the training and I would recommend Bark Busters to my family and friends.